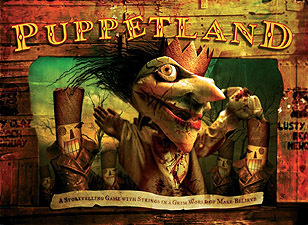 Puppetland is a storytelling game. You play a valiant puppet who speaks aloud every word you say. You speak for your puppet and the Puppetmaster says the rest. You surprise each other at every turn, collaborating moment by inspired moment to unlock your own creativity and find the puppet within. This lavishly illustrated edition of Puppetland has been significantly revised and expanded. It includes a grim storybook fable of the Maker's foul murder; new Tales ready to be played, written by a brilliant collection of authors; and the true story of the creator's life in Puppetland. Your puppets are ready to take the stage. But speak softly, lest the Nutcrackers hear - and come to call with a sharp rap-rap-rapping at the door.